Welcome to holiday_prompts, a low-pressure, prompt-based writing challenge focused on seasons and holidays throughout the year. If you want to join the fun make sure to read the Rules and FAQs- you can write any prompt table at any time of the year! Hello, holiday_prompts! For our first weekly prompt, let's celebrate today's holiday: Grilled Cheese Sandwich Day! » If you fill this prompt, please use the weekly prompt 01 tag along with your user tag. » There's no time limit. Fill this prompt now (April 12, 2019) or anytime after. » Not all of the weekly prompts will be this literal or exactly be holidays/special days. » Any questions please ask. Hello all - we've got a few new prompt tables for you! The masterlist has been updated, as of this post. Mod Post: Changes on the Way! Hello, holiday_prompts! We mods have heard your feedback, and we want you to know that both new tables and weekly prompts are coming. The tables will be here as soon as possible, and we'll start weekly prompts (a combination of both options from the poll since the results were split equally) either later this week or early next week. Please let us know if you have any suggestions or feedback! Mod Post: Possible Comm Change- We Need Your Input! Hello, holiday_prompts! We mods were talking, and we were wondering if it might liven up the comm a bit to have weekly prompts instead of focusing so heavily on whole tables. I, personally, had the idea after looking at other comms, both writing and icons, and being frustrated because there was never a whole table I wanted to finish because there was always at least a couple of really stupid prompts in there that I was like, "Who in the world could ever write/icon that?!?" So, if you've been feeling that way about finishing any of our tables, I come bearing the option of weekly prompts instead. However, I'm not going to make any changes without your feedback, so please fill out the poll below, and if you have any questions, please don't hesitate to comment! There are two options that I could think of for weekly prompts: 1). 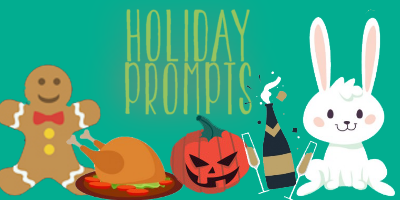 Prompts based on "holidays" falling within that week- holidays that are not really mainstream, kind of like National Black Cat Day or National Siblings Day, or 2). Prompts that are more based on traditional seasons and holidays like what's really going on around us (at least where we mods are in the US)- Summer prompts, Christmas prompts, Thanksgiving prompts, etc. If you have any feedback that you can't leave in the poll, please don't be afraid to leave a comment! Weekly prompts featuring prompts for mainstream holidays and seasons like Spring, Halloween, Christmas, etc. Summary: Sam and Dean have a moment before bed. Set in the eppisode "A Very Supernatural Christmas". Warning Sam and Dean are brothers in a consensual relationship. Summary: Dean wants the Impala to be festive and happy. Hello all - just in time for Valentine's Day, we've got a few new prompt tables for you! Title: What About the ‘Pala? Summary:Wee!Dean doesn't want his favorite girl to be forgotten. Summary: Dean wants the Impala to be warm and dry and John has little choice to make it happen. Hello all - we've got a new set of prompts, for you, just in time for those December writing challenges you may have lined up! **NOTE: Due to the size of the prompts, there's coding included to lower the font size. If you notice it's too hard to read on your site, and want a 'regular' version, just let me know! Summary: Adol and Dogi climb the Tower to the Sky Palace. Summary: Raine tries to rally the party back into school. Hello all - I'm ashamed at how long it took for this to get done.. but you now have a collection of summer prompts. All headers under the cut. Summary: Gabi bakes a special cake to drive Elliot crazy. Summary: Waking up from carbon freeze. Summary: Elly reflects on how much of her beliefs and values have been turned on their head. Summary: Roland feels younger in this strange new world but that doesn't mean it's okay for young boys to have a crush on him. Summary: In which the meaning of a bizarre ceremony involving rabbits and eggs is completely lost on Dahlia. laurapalmer - Mod Post: Changes on the Way! laurapalmer - Mod Post: Possible Comm Change- We Need Your Input!